It's 15:58 in Sumy, Ukraine right now. Soborna Street Center of Sumy, view of the Soborna Street and Pokrowska Ploscha. Kyiv: Maidan Nezalezhnosti - Independence Square, 189.6 miles away. Kaluga: City Panorama, 257.7 miles away. 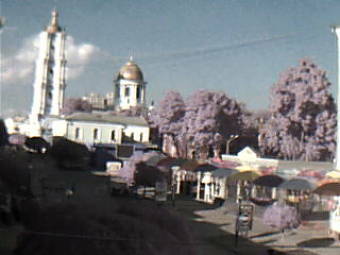 Kaluga: View over Kaluga, 257.7 miles away. Yartsevo: View over Yartsevo, 300 miles away. Ryazan: Ryazan Kremlin, 329.8 miles away.